Battistelli’s former “padrone” made the headlines this week when he was taken into police custody in France and charged with corruption and other breaches of law (“Nicolas Sarkozy charged with corruption”). Nicolas Paul Stéphane Sárközy de Nagy-Bocsa, the former President of France and ex officio co-Prince of Andorra from 16 May 2007 until 15 May 2012 — who has also been known to operate under the false identity of “Paul Bismuth” — was placed under formal investigation on Wednesday on suspicion of corruption, the misuse of Libyan public money and breaking French election campaign funding law. This is not the first time that Sarkozy has been taken into police custody. Ever since his term of office as President of France ended and he was longer by immunity from prosecution he has been under investigation for various alleged irregularities relating to his Presidential election campaigns in 2007 and 2012. “Ever since his term of office as President of France ended and he was longer by immunity from prosecution he has been under investigation for various alleged irregularities relating to his Presidential election campaigns in 2007 and 2012.”Already in July 2014 he was taken into custody following the arrest of his lawyer and two magistrates who were under investigation for allegedly using their influence to obtain information about legal cases against him. Authorised wire-taps of his telephone indicated that he had been in contact with a magistrate, Gilbert Azibert, then a member of the Cour de Cassation, to ask for confidential information about another investigation into campaign donations from the L’Oréal heiress Liliane Bettencourt. In those conversations, it is alleged that Sarkozy promised Azibert promotion to a high-level position in Monaco in return for information on the case against him. The charges which made headlines this week relate to suspicions that Sarkozy accepted up to €50 million from the Libyan despot Gaddafi to fund his successful 2007 Presidential campaign. 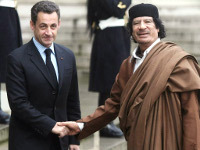 Sarkozy is trying to portray himself as the victim of a Libyan smear campaign as he seeks to rebut allegations that Gaddafi bankrolled his rise to power. “However the extreme opacity which shrouds the EPO’s financial affairs and the lack of an independent Audit Committee since 2011 make it difficult if not impossible to obtain any reliable information about such matters.”However, it should not be forgotten that criminal proceedings have also been launched against Sarkozy in another case of alleged illicit campaign financing relating to his unsuccessful Presidential election campaign in 2012. In this case it is alleged that he engaged in fraud using sophisticated accounting mechanisms to cloak and mask the sources of funds and to circumvent the ceiling for campaign expenditure in 2012, which was €22.5m. Mr Sarkozy denies he was aware of the overspending. This affair is known as the Bygmalion scandal. See Nicolas Sarkozy: French ex-president under formal investigation and Nicolas Sarkozy to face trial over 2012 campaign financing. The most recent developments in Sarkozy’s case may turn out to have implications for the EPO because they are likely to renew interest in the long-standing and persistent rumours that EPO funds were diverted to assist in the financing of Sarkozy's unsuccessful election campaign in 2012. As confirmed by an article published in the French news paper Libération in June 2016 (English translation here), it is generally recognised that Battistelli was “propelled” into his position at the EPO in 2010 by Sarkozy. The timing of Battistelli’s EPO appointment is interesting because he took up his duties in Munich in July 2010 about a year before the Presidential election campaign kicked-off in France in mid-2011. One of Battistelli’s earliest actions at the EPO was to press for the disbanding of the independent Audit Committee which he managed to push past the Administrative Council in 2011. At around the same time France was playing a key role in the 2011 international coalition that deposed and killed the Libyan leader Gaddafi. Back then Gaddafi’s son Saif al-Islam claimed the Libyan regime had financed Sarkozy’s 2007 election campaign. Qadaffi’s son is shown above with the person many hold responsible for the attack on Libya. If these allegations are true, then it would be reasonable to assume that in 2011 Sarkozy who was busy trying to eliminate his one-time ally in Libya was also on the look-out for new sources to fund his upcoming Presidential election campaign. Battistelli’s close connections to Sarkozy and his known affiliations with the UMP (subsequently renamed “Les Républicains”) have given rise to a lot of speculation at the EPO that he may have been involved in the funding efforts for the 2012 election campaign. However the extreme opacity which shrouds the EPO’s financial affairs and the lack of an independent Audit Committee since 2011 make it difficult if not impossible to obtain any reliable information about such matters. In this connection it should not be overlooked that one of the EPO’s auditors since 2014 is Mr. Frédéric Angermann who coincidentally used to be the secretary-general at the INPI from 2007 to 2012 when Battistelli was the Director of that institution. Under these circumstances, it seems unlikely that any clarification will be forthcoming from official EPO sources.